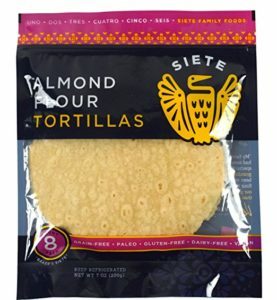 Almond Flour tortillas by Siete are a 100% paleo-friendly alternative to wheat and grain-based tortillas and sandwich wraps. I will begin by stating that Siete almond flour tortillas are absolutely delicious when you prepare them properly. When I first tried these out of the bag I was disappointed in how flimsy and small they were until I learned how to make them. The secret to making a delicious sandwich, wrap, or tortilla with Siete almond flour tortillas is that you need to lightly toast them first. I usually put a little 100% pure coconut oil or butter on them and saute them in a frying pan until they turn slightly golden brown. After they are sufficiently browned, the texture turns slightly crispy and you can fold them in half like a taco shell or almond flour wrap. They have a delicious crunch and very subtle flavor that will not overpower the contents of your sandwich, taco, or burrito. 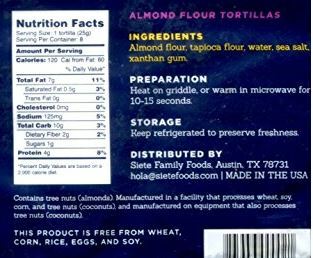 Siete Almond Flour tortillas are made only from Almond Flour, tapioca flour, water, sea salt, and xanthan gum. There are no grains at all. All of these things are paleo friendly and meet the safety standards of a 100% gluten free diet for Celiacs and others who might have sensitivities to gluten and grains. If this all sounds too good to be true, it’s because I have yet to bring up the price. Er, well, Paelo fans, sorry I have to go and spoil it all for you. Siete Almond Flour Tortillas are Way too Expensive! My local health food store, Natural Grocers , sells an 8-pack of Siete almont flour tortillas for $8.79. That is over $1.00 per very small, tortilla. This is way too expensive. In fact, I have noticed most recently that my store lowered the price clearance at $7.15. I took the last couple of packs they had and so far they have not re-stocked their shelves. I don’t think many of us can afford to eat this healthy. If grain-free, healthy, almond flour tortillas are ever to replace wheat-based products like bread and flour tortillas, then the price is going to have to at least become somewhat reasonable. Here is the part that aggravates me. I think Siete is hurting their own sales by having their product priced this high. When I looked into the costs of almond flour, tapioca flour, water, sea salt, and xantham gum, I determined that I could make these at a mere fraction of the cost. How many more tortillas could the Siete family sell if they cut their price in half or by 3-times? I wonder if anyone in their company has ever done a profit vs demand analysis to see if they are not shooting themselves in their own feet by selling their goods for such an exorbitant price. What irks me about this is that people who have dietary disadvantages of are being taken advantage of. Unfortunately, Siete is not the only one selling their grain-free wraps at an outrageous price. A couple of other equally or more expensive alternatives are: NUCO and Pure Wraps . You have to wonder if someone is going to wise up and realize they can sell more and increase their profits by reducing their price. The demand for grain-free foods is more than enough to make up for the difference in lost profit margin.